I've been looking for inexpensive or free ways to mulch my garden. My husband has a business that generates a lot of cardboard boxes from items shipped to him. The children generally play with the boxes until they are destroyed, then they go out with the trash. I wondered if the boxes could be used for mulch so I did a little research. 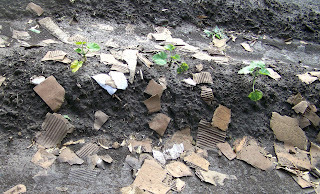 I found that so long as the cardboard isn't covered with a "shiny" coating, it can be used as mulch for the garden. You will want to tear the cardboard into pieces no bigger than 4 inches by 4 inches. If your pieces are bigger, you will run the risk of the wind catching the pieces and propelling them into your plants. 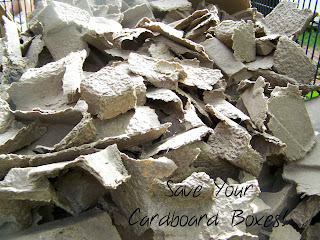 Then wet the cardboard before placing around your plants. This will help ensure that it stays in place. 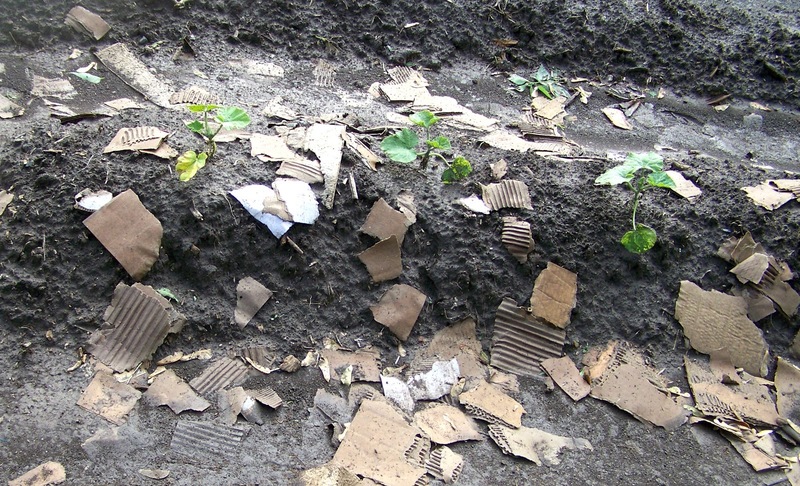 Cardboard makes a good mulch because it helps prevent weed growth and moisture loss. It also breaks down over time. Unfortunately, cardboard doesn't hold up so well to high winds. As you can see in my photographs, near tornado strength winds blew the cardboard all over my garden. I will still use cardboard mulch because it did work well for the week prior to the big storm, withstanding normal Kansas winds. Interestingly, the leaf mulch that I had placed around my tomato plants stayed in place for the most part after the severe storm. To make leaf mulch, simply rake leaves from your yard and place them around your plants, then water! Sawdust - Let rot until it is dark in color before using. Apply 1 1/2 to 2 inches thick around your plant. Pine needles - They are plentiful in many areas and look cool! Apply 3 to 4 inches thick. Hay and Straw - Spoiled hay makes an excellent mulch. I've even used straw from my chicken coop, although some would caution that salmonella can be introduced into your garden in this manner. Old newspapers - Avoid colored newsprint, I've heard it may contain lead. Apply in layers 4 to 6 sheets thick and weight down to keep it from blowing away. Grass clippings - Just be certain to let dry out a bit before applying to avoid clumping and don't use grass from chemically treated lawns. Partially broken down Compost - Makes a wonderful mulch! Feeds your garden while sheltering the soil. Mulching may seem like a lot of extra work but it can save you a great deal of work later on. When applied properly, mulching can conserve moisture in the soil, thereby reducing the frequency that you will need to water. Mulching also can smother weeds, which will save you a lot of back breaking work. Mulching insulates the soil, providing a nice even temperature for your plants' roots. Mulching provides a cozy habitat for earthworms which are just all around "good guys" in the garden. 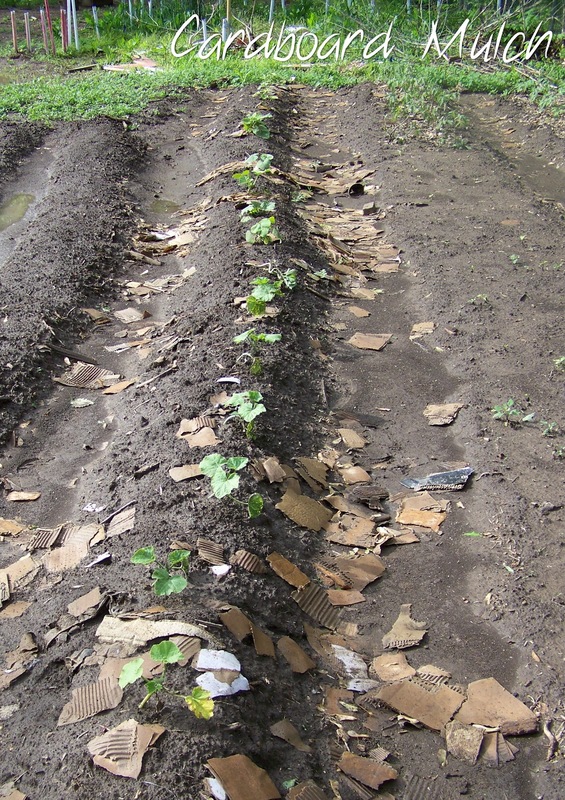 Mulching helps prevent rotting of vegetables such as squash, watermelons, cucumbers or any other vegetable that normally would touch the soil by creating a barrier. Mulching also guards against soil erosion from heavy rains or watering. Apply in spring after the soil has warmed up slightly. If you apply while the soil is still cold, you may slow down plant growth. Apply after weeding if possible. 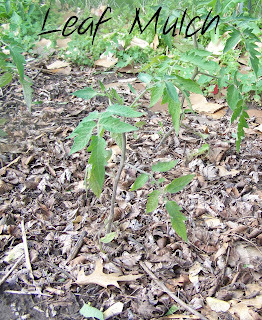 A thick layer will smother existing weeds but you can get by with less mulch if you weed first. 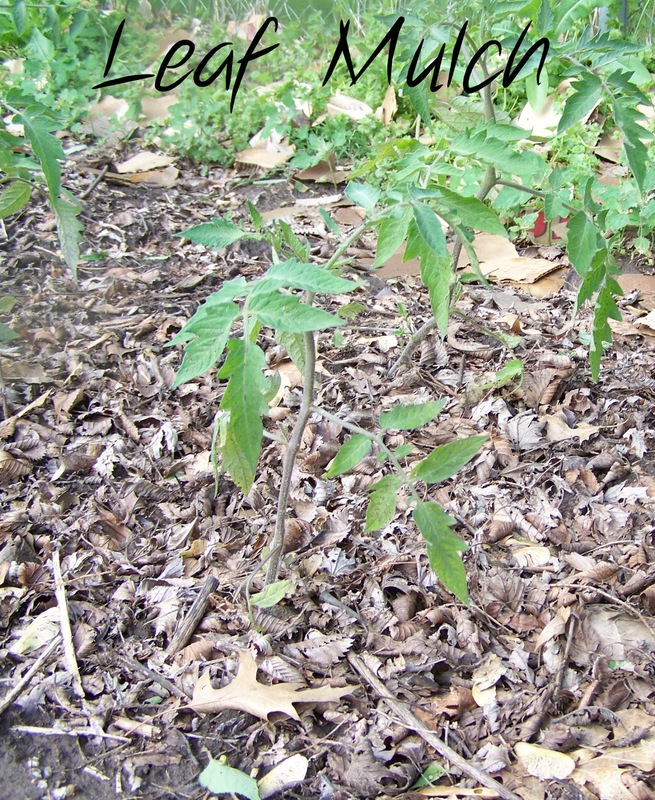 It may seem obvious, but wait until your vegetables or plants are up before mulching. 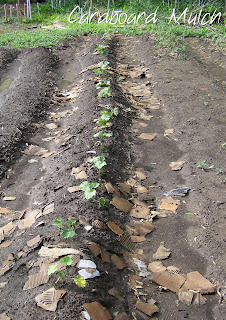 If you mulch over the newly planted soil, you may not ever see your seedlings! I'd love to hear about your ideas for free or cheap garden mulch! We use free leaves as mulch as well. We literally drive around older neighborhoods with mature trees in the fall and load up on leaves. The only downside is that sometimes there are also branches in the bags. But they are free and we also get free trash bags to use throughout the summer for our lawn litter! That's a great idea! I never thought about the free trash bags that come with the free leaves!!! I had to stop mulching as I was overrun with slugs (not that they run) so I began turning the the debris and manure under before spring and the worms seem to love it. I hoe the area near the plants and let the rows bake hard in the summer to control weeds easier. I also depends on how wet the season is year to year. Great tips Sunnybrook! Thanks for sharing! Thanks for the good tips. I had heard that cardboard makes a good mulch. Great post with lots of info, Poppy! I use our grass clippings as mulch all summer long. Even when I lay it on fairly thick, I don't seem to have any trouble with it clumping. When it dries, it makes such a nice, clean surface to kneel or walk on. And I can't believe how fast it decomposes and disappears into the soil . . . which must indicate that the worms like it! Of course, our grassy areas aren't treated with any poisons so there is nothing in the clippings that could hurt the growing produce. It's nice to know that you don't have to let the grass clippings dry first! Then all that great decomposing activity can take place right there in the garden for the most benefit! Thanks Mama Pea! I used our cardboard boxes whole and just laid themon the ground and added some leaves on top. They break down fairly quickly though and the weeds find ways around them. Thanks Becky! Good to know you can use the boxes without tearing them into little pieces. Mine just kept blowing way when I used them whole but I didn't put anything on top of them. I new you could put coffee grounds in the compost pile, but I never thought about using it for mulch. I am saving my grounds separately now and can't wait to start using them as compost. I'm thinking corn uses a lot of nitrogen so I'll probably use the coffee around the corn. Thanks for visiting Linda! I have started a compost bin made from a garbage can. I put my shredded office paper in it along with discarded food and grass clippings. So far, so good. Good to hear! I'm so happy to know more people are composting. It's a good thing all around! Thanks for stopping by! It was quite a sight to see! I wish I would've taken photos before the store....the mulch looked much nicer! I'm right here Stay @ Home-Gardener! My husband's business has been BUSY!!! I've been trying to help him out as much as I can...And it is gardening season! I think I need to have one of my kiddos take photos while I'm working in the garden just so I can post something LOL! How is your garden going? The garden is roaring along now. Finally producing edibles. The kales are big enough to harvest. There is enough plants of them to be able to harvest every few days for sauteed greens. We have eaten more salads these last few weeks than ever have previously. Thanks Fox! I've got a prior committment but I will pass the word around! Great post Poppy! I've used sheets of cardboard but never though to make it in smaller pieces. Good on the other ideas as well. Thanks! I have been laying cardboard down (just started this recently) in my rows to use as weed block. One of my neighbors does this and its great! I have to collect boxes when I see them or get one in the mail. But they work super just lay in the rows. Once they get rained on they stay flat good. I put a couple of those wire landscape pins in mine to hold them down till a rain comes. I saw a tv show where they were using smashed drink cans. Not attractive, but claim is that it works well. The examples were roof gardens, so no roadside appeal to worry.about!